Dr. Kirk Lewis Career and Technical High School has deployed adjustable standing desks in a freshman geography class in an effort to support project-based learning and open collaboration. 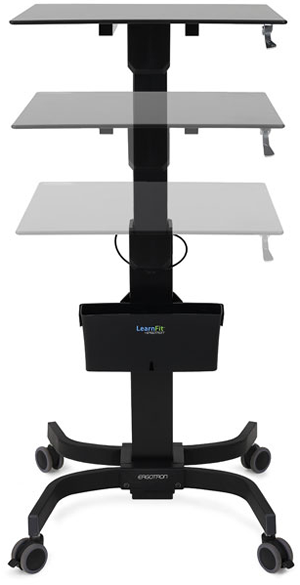 The school adopted LearnFit desks from Ergotron, which allow students to change the height of the desktop for sitting or standing or for using different technologies, like tablets or notebooks. The desks also feature casters to easily reconfigure the class for small group collaboration or lecture. "Since the introduction of the LearnFit standing desks student engagement has gone up markedly," said Jason Rhodes, geography teacher at Dr. Kirk Lewis Career and Technical High School, in a prepared statement. "Students are more actively participating in discussions and the amount of time that it takes students to complete tasks has lowered by four to five minutes, which is a big deal in a 45-minute period." Rhodes said the improvement in attention during the afternoons, when it tends to flag the most, has been particularly notable. "The afternoon performance with the LearnFit desks is night and day," Rhodes added. "I've had no sleeping issues recorded this year, and any time I sense a potential issue I have the students change their positions, which does a great job of recapturing their attention and focus." LearnFit desks cost $499. More information is available at ergotron.com.